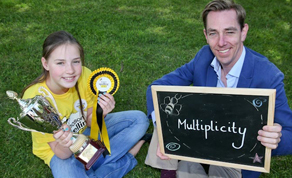 Produced by Mind The Gap Films, ‘Ireland’s Spelling Bee’ will air on RTÉ One on Sunday, August 30th at 6.30pm. Produced by Mind The Gap Films for RTÉ, the documentary is directed by Garry Keane, produced by Jennifer Healy and Executive Produced by Bernadine Carraher. The show is edited by Paul Giles and shot by Emmet Harte & Michael O’Donovan. The Commissioning Editor for RTÉ is Colm O’ Callaghan. With the Eason National Spelling Bee competition, thousands of children from schools all over Ireland competed to be crowned All Ireland Spelling Bee Champion. The documentary film captures the next generation of young Irish people and is hosted by presenter Ryan Tubridy. The show captures the county finals to the provincial finals, culminating in all four provincial champions competing in an All-Ireland final held in RTÉ HQ. Produced by Mind The Gap Films for RTÉ, ‘Ireland’s Spelling Bee’ will air on RTÉ One on Sunday, 30th August at 6.30pm.